The statement ‘keep what you love, sell or donate the rest’ would be easy, were it not for this overwhelming sense of attachment we have toward unnecessary things in life. We cherish bad memories arguably more than our good memories. When it comes to videogames, the natural inclination is to keep everything. How often do we hold onto mediocre videogames, bad memories, and other things out of convenience versus actually wanting them to occasionally enjoy? I think more often than we should. We should hold onto everything we enjoy and discard the rest. Simple? Yes. However, our likelihood to actually critically look at an object and decide if it’s worth the potential risk of embarrassment over wanting it again later might be enough to make us hold onto things longer than we need them. We can purchase almost anything again. If it’s a gift, perhaps we don’t want to offend the gifter, or perhaps, we value that memory much more than the object itself? Why not record that memory either in writing, as a photograph, or in some other digitally-compact way then give the physical object another home? Especially if it takes up too much physical or mental space, letting things go can help us move on or solidify our priorities. My NES collection was too unwieldy. 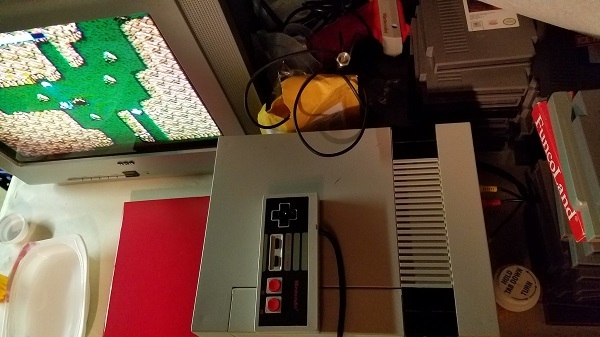 Unlike some of my other collections, which have little to no excess, I was able to amass nearly 200 NES games for a reasonable enough rate per game that I never even played a majority of them. It was a slow process parsing through them. Alphabetizing, analyzing, testing, playing, and cataloging. This essay may seem like overkill. Maybe it is. Still, for me, I find that something should be done right, or not done at all, and going about it this way will yield the right results: the NES collector’s market is at a good point right now, so I can sell everything I bought for a profit, and my proximity to resellers is close now, compared to wherever I may move. Even if I only break even, it will still be a nice opportunity to practice selling things. After all, there is a set value for each game. Unlike some items with highly subjective prices, like clothing, books, or action figures, the average value of any videogame – even if that value is nearly free – is reasonably agreed upon by most collectors. The NES, in particular, has many well-documented average values on each game on the console. Compared to any of the aforementioned collectibles, this value rigidity enables anyone to practice selling. If the given offer is too low, especially taking into consideration factors like a videogames store’s overhead or someone’s rude attitude, then pass and move on. Videogame prices might actually be objective. My copy of King’s Knight is in great condition. It would command the higher end of the price spectrum… if I were interested in selling it. Not in this pass-through of my collection. I’m just selling the duplicates right now. Inspirations: I was brainstorming the values of my collection. King’s Knight isn’t worth much money, but I like the game, so it has an added value to me, and I thought it was interesting how the buying/selling values of videogames might actually be objective. 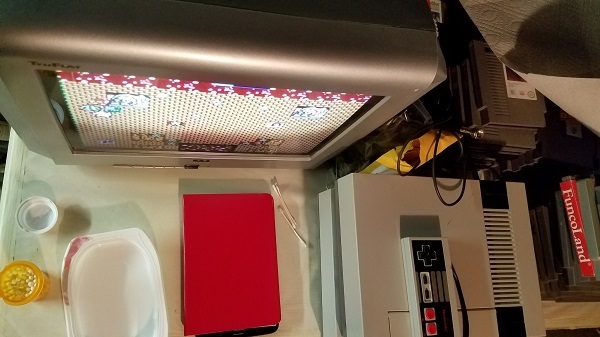 Photos: My workbench at the height of my NES collection taking it over, midway through a playthrough of King’s Knight.